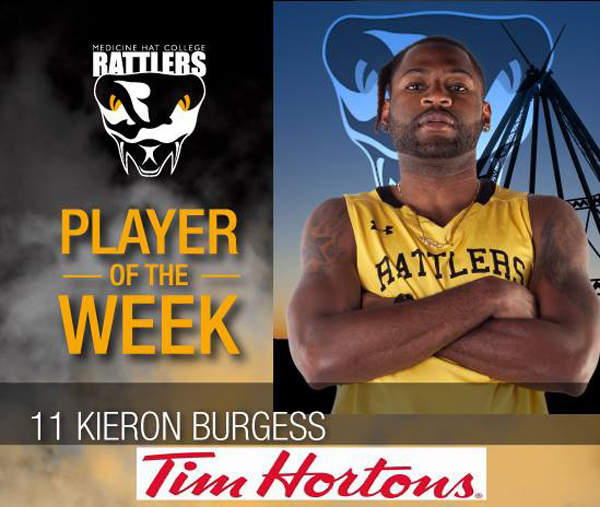 Kieron Burgess led the way in a 108-61 victory for his college basketball team, finishing with 41 points and a massive 31 rebounds, which broke the ACAC single-game records for most rebounds and defensive rebounds. The ACAC — Alberta Colleges Athletic Conference — is the governing body for collegiate sports in Alberta, Canada. Mr Burgess, who plays for Medicine Hat College in Canada, also earned Canadian Collegiate Athletic Association [CCAA] Male Athlete of the Week honours for his impressive showing. The ACAC website said, “In what was an outstanding effort by the MHC Rattlers, Kieron Burgess led the way in a 108-61 victory over the visiting Ambrose University Lions. Kieron finished with an impressive 41 points and a staggering 31 rebounds. For his efforts, Kieron set 2 ACAC records. job well done fella ! Very impressive mate! Keep it up!